While the Democrat party continues to call for repeal of the Second Amendment, new restrictive gun control laws, and an outright confiscation of your firearms, Republicans offer commonsense solutions to school shootings. First and foremost among those solutions is eliminating gun free zones by arming qualified teachers, resource officers, retired veterans, or other individuals to help protect our children. We need to “look at the possibility of giving concealed guns to gun adept teachers with military or special training experience – only the best,” President Trump has said. Who could possibly be opposed to that? Liberals of course – because to them, guns are big bad scary inanimate objects that fire on their own accord, not weapons of self-defense. 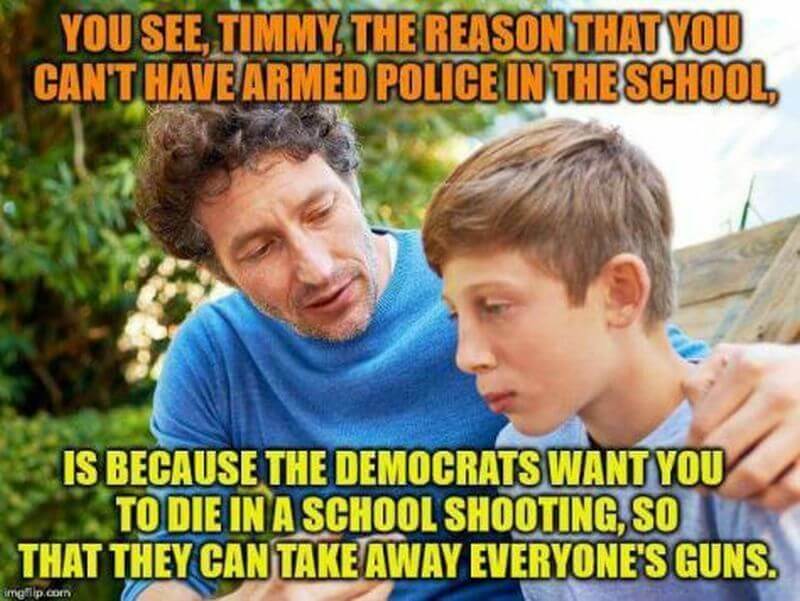 This brutal meme drives the point home, revealing the true reason why Democrats don’t want armed guards in schools. Because school shootings allow them to push their agenda. Don’t think the left wants to ban armed guards? Democrats in New York actually introduced legislation to do so. In their mind, assuring that the only armed individual in a school is the shooter is the way to go. They’re openly leading more students to their demise by making them sitting ducks. Even their friends in the liberal media like to see school shootings, using them to promote their anti-gun agenda. There isn’t a crisis the Democrat party isn’t willing to use as an emotional tool to promote their agenda. They’ve proven it time and again. That’s why they don’t want to see armed guards in schools – because it will work to help stop school shootings. And if school shootings drop, they have nobody to exploit. Do Democrats use tragedies to exploit and promote their agenda? Share your thoughts below!